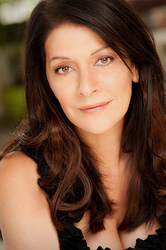 Although Marina Sirtis, a classically trained stage actress, has played Ophelia in Hamlet and has appeared in films alongside Faye Dunaway, Bruce Willis and Sandra Bullock, she'll be forever known as Deana Troi, the psychic counselor from the Star Trek franchise. Lately, Marina has been a guest star on several popular television shows such as The Closer, Family Guy and The Cleveland Show. Marina loves her many fans, appearing frequently at conventions around the world, which is why she is known across the galaxy as "Imzadi."